Cooling rabbits. Heat kills rabbits. How to keep outdoor pet rabbits and meat rabbits cool throughout the summer heat. No matter where you live, summertime means your rabbits may be stressing in your area's summer heat is brutal. Unless you keep your rabbits in an air-conditioned space, heat can literally place your rabbits’ lives at risk. 85 degrees Fahrenheit (29.44 degrees Celsius) is just about the maximum temperature at which your rabbits remain relatively unstressed. At temperatures over 90 degrees (32.22 degrees), rabbits can die. Cooling rabbits in summer becomes a critical issue, because the effects of heat stress are cumulative. Don’t let your rabbits’ survival fool you. If they survive days one and two, they may be dead by day three of a heat spell. Temperatures over 85F for several days in a row can cause temporary summer infertility (sterility) in bucks. There's nothing magic about 85F however. Much will depend on your individual animals. Young bucks 6-8 months old might remain fertile throughout their first summer, while unacclimated bucks could become temporarily sterile just as soon as the temperatures begin to climb into the mid-80's. The heat is harder on older bucks than on newly mature ones. The excellent cooling measures below may enable your buck to continue to sire litters through the summer, if he will avail himself of them. Institute cooling measures when the ambient temperatures hit 85F, even though they may not yet appear to be the slightest heat-stressed. The infertility typically lasts roughly 3 months. In bucks that have gone temporarily sterile, the length of the heat wave and the extent of the buck's exposure to excessive temperatures will give some indication of when his fertility will return. You can expect a buck's infertility to last 1 - 1.5 months beyond the point that temperatures have returned consistently to a range below 85F. Heat is particularly rough on pregnant and lactating does and young kits. The does are already stressed from growing and feeding their babies; even moderately high temperatures may trigger heat stroke and death. You’ll know the kits are in trouble when they crawl out of their nestbox burrows, lie sprawled about, and pant like crazy. You can bring the nestboxes in the house during the worst of the daytime heat, returning them to the doe in the cool of the evening. The doe will be just fine with this, most likely. Both does and kits fare excellently when housed under a misted shade cloth canopy or a purchased carport canopy or party tent. See below! Directly mist the rabbits with a spritzer, even submerge most of the rabbit (not the head) in cool water if in severe distress. Turn a 24 inch diam. concrete pipe on end, resting on flat pavers to prevent rabbit from digging out. Mud an 8" diam. concrete pipe to the hole as a runway. 8" pipe should be at least 18" long. Cover large pipe - I think I used plywood, and placed a rock on top for security. Very low-tech. Attach a normal all-wire cage to 8" pipe. You'll need to cut a hole in the back to accept the 8" pipe. Secure the cage so it cannot become dislodged. Grow strawberries or rabbit food on the dirt mound! You can literally cover the entire chicken-wire-surrounded dirt mound with edible greenery, though the underground rabbit house will stay cool with just the dirt to insulate it. Get our enhanced and illustrated plans for building this underground burrow here. Review all our World of Raising Rabbits e-books here. I built one hole in this fashion when we lived in the high desert of California, just to see how well it would work. It worked great! We called it 'The Hilton' and the lucky buck who lived there never went temporarily sterile or suffered heat stress. (But our shadecloth/mister system (see below) also worked amazingly well, and was more space-efficient. 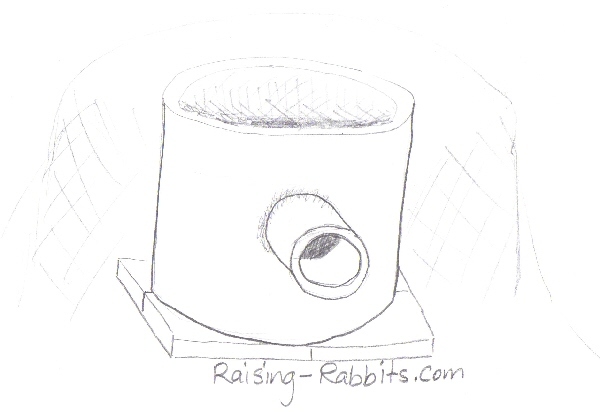 The Italians were experimenting with cooling rabbits using underground rabbit housing at the same time I was -- read about their "Unconventional Rabbit Breeding System for Hot-Climates". Their system is similar, and their pictures are much nicer! Depending on the size of your rabbitry, any of the shade cloth products here should serve you well. Short of an air-conditioned barn, this might be one of the more ideal solutions for cooling rabbits. When we lived in the desert of California, our main method of cooling rabbits was shade cloth and misters. I covered that framework with the heaviest shade cloth I could find, doubled and sewn together. I needed to get quite a bit of it, and fashion it together into one piece that covered an area probably 20 x 20 (feet). See picture below, but I gotta tell you, I don't remember it looking so...nice! Then I made a mister system, again with 1/2 inch schedule 40 PVC) with very low volume misters placed, I think, 6 feet apart, in three rows, on top of the shade cloth. These were brass misters in specialized PVC fittings in 1/2 inch PVC pipe. Fittings and misters are available from rabbit supply manufacturers. The hose end of the PVC included a pressure regulator, a ball valve, and the hose attachment fitting. I'm telling you, on the hottest day in the middle of summer, it was cool as a cucumber under that shade cloth. Well, okay...85 degrees...tolerable enough for the rabbits. And me - I hung out there when I got too hot. Despite the misting, there was no dripping on top of the rabbit cages. Extra water ran along the outside of the shade cloth and dripped on the ground from the edges of the framework. The whole system worked like a charm, and the biggest problem was the ground could get a bit damp - okay, puddled! - after a few days straight of 100+ temps. Please note that it is very easy to modify these conceptual plans according to the requirements of your own space. However you configure it, just be sure you space the misters as recommended by the manufacturer's specifications - overlapping the diameter of the mister spray. 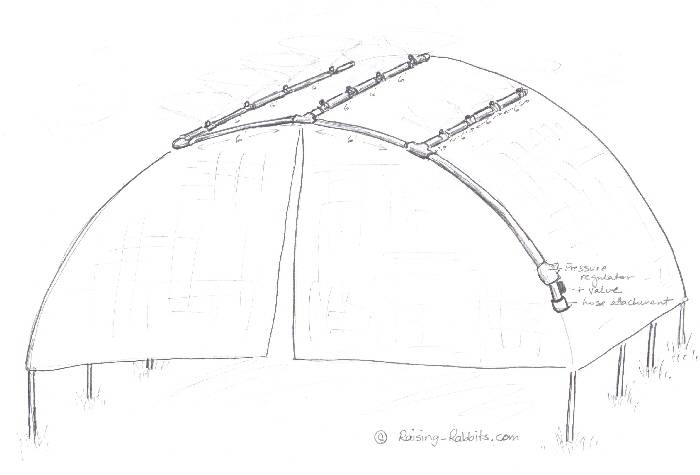 HINT: It might be just as easy to use a carport canopy as the framework for your homemade shade cloth canopy. Because air cooled by mist can sink through the shade cloth into the rabbits' environment, This method is a very effective cooling strategy. Now that carport canopies and various sizes of party tents can be had for very reasonable prices, it makes perfect sense to house your rabbits in one, assuming you do not have an official barn or shed to keep them in. 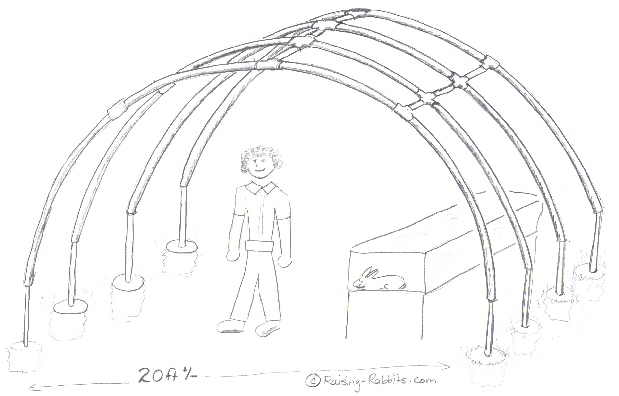 At Aurora Rex Rabbit Ranch, we use a set of 3 canopies measuring 20 feet by 10 feet (6 m by 3 m). In Northwest Washington State, there isn't much need for cooling, but I situated misters above the canopies, just like I had done for my shade cloth canopy in the high desert of California, for those few days when the ambient temperatures topped 90 degrees F (32 degrees C).